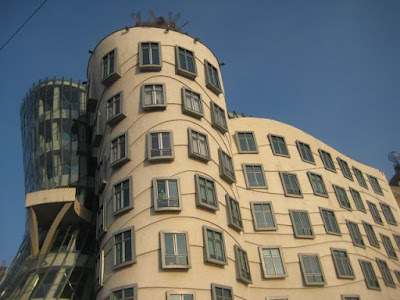 It's a famously original building with a few different names and lots of interesting angles. 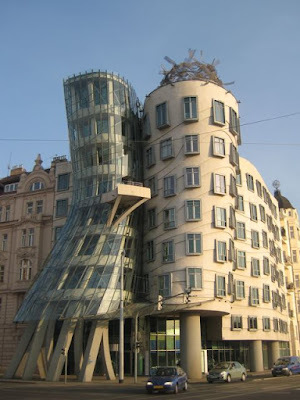 This architectural landmark is known as the "Dancing House." And "Fred and Ginger." And the Nationale-Nederlanden building after the bank that commissioned it. I'd always been curious about the restaurant that once lived atop the Frank Gehry/Vlado Milunić creation. 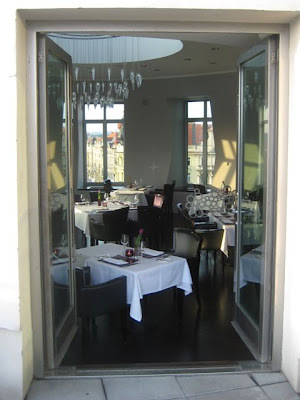 But the menu and the prices of La Perle de Prague left me uninspired. 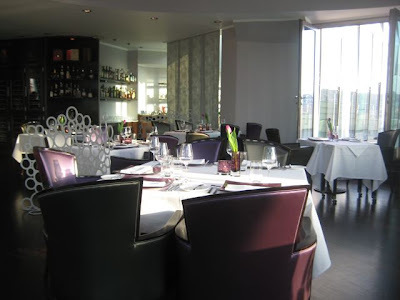 When I heard La Perle had closed and was replaced by a new restaurant, I found the online menu of Céleste. And there I found inspiration for a visit. The prices were a bit lower, but not cheap by any means. Just reading the menu on the web, I had trouble deciding what I would order on a visit. We headed over on Good Friday to test my decision-making skills. 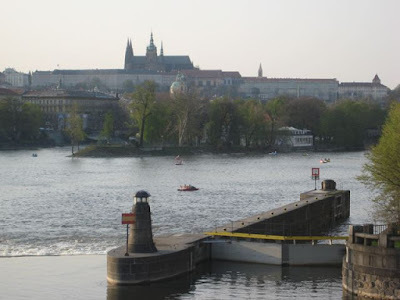 We crossed the busy intersection in front of the building, pausing look back and take in the early evening view of Prague Castle across the river. We entered the small street-level bar , called Bar Céleste. The server there approached us with an officious tone. "Yes, hello. Can I help you?" "Do you have a reservation?" He move quickly toward us, and there was something like suspicion in his voice. "May I suggest a drink at the bar before you start?" I considered it for a moment, but just then, a noisy car went through the intersection outside the open door and convinced me otherwise. "We'll go up to the restaurant." He called the elevator. The man gave us both an unpleasant feeling. But I want to be fair. I did walk in with my little camera out, thinking I'd take a picture of the bar. The building attracts plenty of tourists, and several were snapping pictures outside. I'm sure pushy shutterbugs have to be fended off on occasion if they wander inside. When the elevator door opened on the top floor, we had a very different experience. We immediately recognized the host, and he recognized us. He used to run the restaurant Atelier in Vrsovice. We were regulars there until it was sold and went downhill. It closed down a while ago. We looked around the modern-art inspired dining room. It is divided into a larger, circular area, and a smaller, thumb-like section. The host said we could choose one of two tables in the different sections. 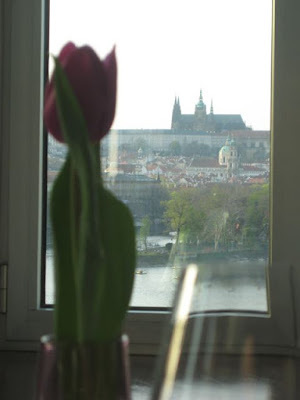 Most have great views across the river, but he saw us looking longingly at an unoffered two-top with the best direct view of Prague Castle. "You're the first ones here. You can take that one." 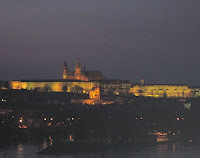 We've lived in Prague for many years and see the castle all the time, but V was still thrilled. Each table had a purple tulip, in keeping with the room's purple accents. 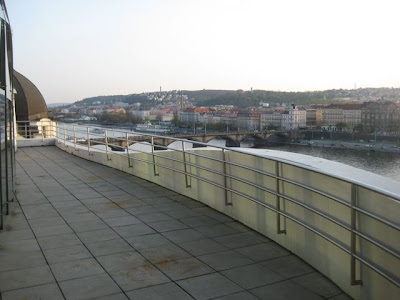 Before the meal, I took a walk out onto the building's terrace. There were no tables out there, but it'd be a nice place for some when the weather stays warmer at night. A waitress brought a bread basket and asked us to choose the type we wanted. Maybe it's just me, but I prefer to have the basket on the table. 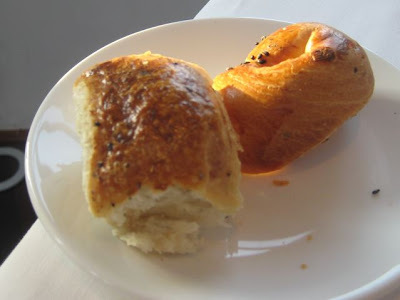 V got rosemary bread, and I had an onion roll. V's was slightly warm. Mine wasn't and I wished it was. But still, this was good stuff, fresh, moist, and a little sweet. There was fresh butter with fleur de sel. I took note of the music. It was barely audible, and nondescript, with some drum beats bleeding through. We both thought something more stylish and soothing and at a proper level would add to the atmosphere. Then came the amuse bouche, a duck foie gras mousse. I'd say it was one of the best pre-meal offerings I've ever had. 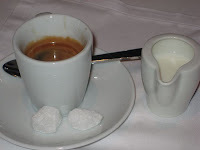 It was served in a small espresso cup or demitasse, but it was substantial. 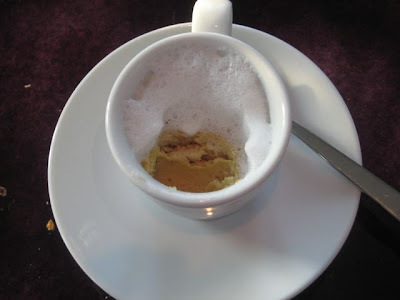 Underneath a creamy foam was the smoothest, lightest, cleanest-tasting pate I can recall. It had a hint of sweetness along with a subtle, nutty flavor. With its cool, ice cream-like consistency, it was something I could imagine having for dessert. And here, perhaps, is the highest praise of all. V cannot stand duck or goose liver. She had a taste and actually took a second bite, clearly impressed. I'd never seen that before. Still, she gave me the rest of hers, which I gladly consumed. Before the amuse bouche came, I almost ordered the duck foie gras terrine starter. I was glad I didn't -- that would be too much, even for me. I was very curious about the ravioli main course. The host said it would be no problem to get a half order as an appetizer (188 CZK). It rested on a pool of perfectly melted butter. Assertive Parmesan cheese shavings and sage sat on top. 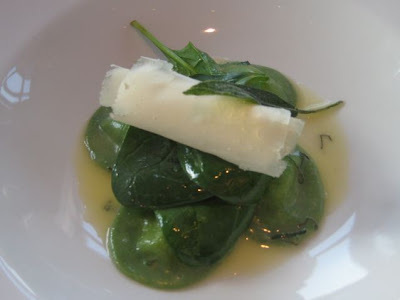 The small ravioli held a generous amount of ricotta, which I have fondness for. I'd say the dish was competent, but simple, with no big wow factors. One of the reasons I ordered the ravioli was because I love sage. We even grow it at home. So, I wished it came with more than just a few small leaves. V got the half Atlantic lobster (495 CZK). On the side was beetroot and jus perfumed with star anise. She was in heaven. 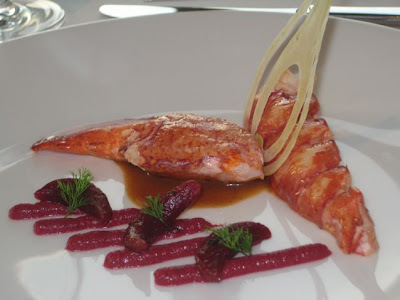 The cold lobster meat, most of a claw and half a tail, had been properly prepared -- delicate and sweet. In this town, we've had our share of mediocre, over-cooked, over-priced lobsters. The beets had a clean flavor, without much of the earthy taste I usually associate with that root vegetable. When we finished it, I asked V for her opinion. V was drinking wine by the glass, a Grüner Veltliner, I believe. (150 CZK each). We also shared two .7 liter bottles of Mattoni (110 CZK each). I was glad they offered Czech mineral water, unlike some places that only pour fancier Italian stuff. As I mentioned, I had trouble deciding what I would order. I was torn between the Moravian lamb chops and the Moravian veal tenderloin. 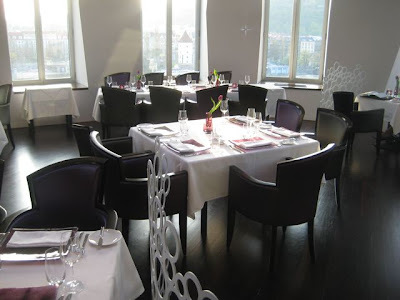 In the end, I went for the veal (525 CZK). 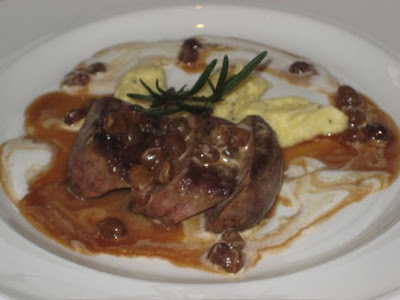 It came with "marbled Marsala juice," Corrinthian raisins, and a creamy polenta. Sorry about the soft focus on the photo -- I was in too much of hurry to get a taste and didn't check it carefully. On the plate was a tender cut of meat, not very large, sliced into four smaller pieces. It could have used a touch more salt, but it was close to perfectly seasoned. The rich sauce was lightly sweet, and the raisins provided bursts of greater sweetness. I do tend to enjoy sweet dishes and favor anything Moravian (V is both). I'd probably get it again -- after I tried the lamb chops. The polenta deserves special mention. It was fantastic. Spiked with rosemary, it was impossibly creamy. We were fighting over the three dollops of it on the plate. I used to hear people rave about Gordon Ramsay's creamy mashed potatoes, and I have to say, he should take creamy lessons from this polenta. V got the scallops (600 CZK). They had a morel crust and came with asparagus. We both felt disappointed. 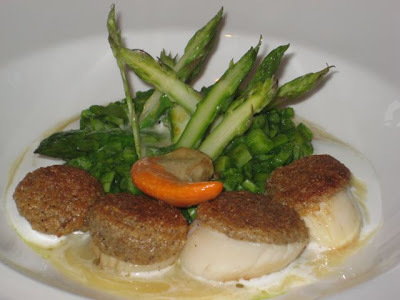 First, three of the four scallops were very small. Second, those three were also slightly overcooked. There was too much toughness to the flesh. The fourth one was larger and, perhaps because of its size, was cooked correctly. It was much more delicate and tender. V is a big asparagus fan, more so than me, but she thought that, despite the fancy presentation and the addition of "green marmalade" it was fairly ordinary. We didn't really figure out what the "marmalade" was, aside from diced asparagus. I'd have to say the morel crust was my favorite part -- very buttery. For dessert, I ordered the chocolate lingot (195 CZK). 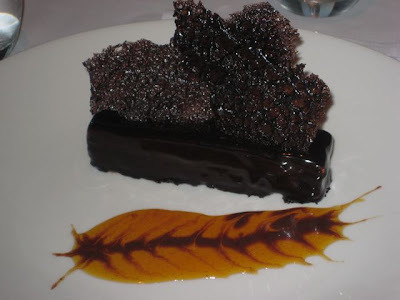 Essentially, it was a chocolate mousse, on top of a long, thin cookie, with a strip of dark chocolate in the middle, and covered with dark chocolate. On the side was an intensely sweet and sour orange syrup. The flavor reminded me of an orange lollipop. In a good way. If you are into intense cocoa experiences, this is for you. I'm one of those people, and I liked it on that level. But I agreed with V's assessment that there wasn't much that was original or extra special about it. Perhaps our host sensed V's need for the exotic, and he suggested a special dessert. 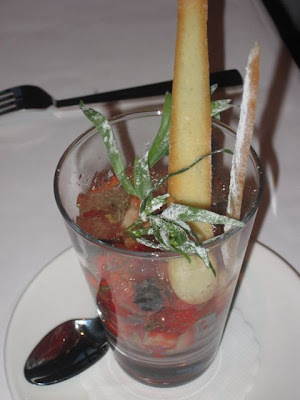 Usually, we share just one, but she decided to get the strawberries with Reisling jelly and fresh thyme (195 CZK). "It's different and weird. Like me," she said. I agreed. The thyme was a great touch. V finished with an espresso (65 CZK). She asked for milk with it, which came heated in a tiny pitcher. The thought the odd lumps of sugar were cute. The total bill came to 2933 CZK without tip. That's a lot for a dinner. The servings were fairly small. But I did feel full afterward. The scallops weren't. And perhaps not the ravioli. The lobster, veal, and strawberries were. It was something of a split decision. I asked V if she would want to return to the Dancing House for dinner. "Yes," she said, flashing an expression of horizontal desire. "For that view. And to try the lamb." But what about the beer????? Celeste has the magnificent Kout na Sumave beers - one of only two places in Prague. A beer so good you will not touch a pale lager made by the InBev/Heineken/SABMiller stables again in your life! Thanks for bringing it up. I wasn't drinking that night or I would have noticed and given one a try. Velký Al beat me to the punch here. I just want to add that, when I was there with Evan Rail the bar manager told us that they were selling 3 times more beer than they had expected. The reason is simple, it is a good beer. Why posh (or wannabe posh) restaurants keep on stocking the same old stuff that, besides being not that good to downright awful, cost them more than beers like Kout is beyond my understanding.